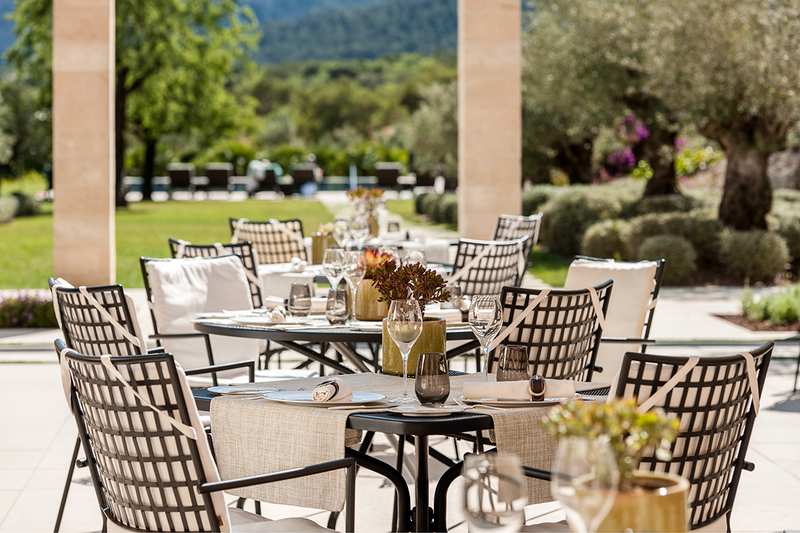 When it comes to choosing a spot for lunch, it´s time spoil yourself at Restaurante Olivera. Located at Hotel Castell Son Claret just in the south west of the island it´s location in the foothills of the Tramuntana mountains is hard to beat. The spectacular arrival at the hotel will take your breath away with its different coloured blooms and the rows of palm trees. As you step out, the sound you hear will be the tinkle of sheep bells in the distance countryside. The elegant dining room is light and bright and spills onto a glorious dining terrace, weather permitting, with views across to the swimming pool, gardens and the Tramuntana mountains beyond. Olivera is one of two restaurants at the hotel, the other being Zaranda holding two Michelin stars. Both are overseen by the award-winning chef Fernando Pérez Arellano so you can be assured of an excellent dining experience. Olivera Restaurant has introduced a `Taste on the Terrace ´3-course set lunch menu, offered Monday to Friday at just €30 per person which is unbelievable value for such a sublime food. Celebrating Mediterranean cuisine and following chef Fernando´s recommendations, as a starter you can choose from a soup or salad. Examples of what may be on offer are vichyssoise of celery and potato with poached egg and truffle oil or a salad of green leaves, capers, cured cheese, fried almonds and raisins. For the main what about Milanese chicken, spinach, scamorza cheese, Kalamata olives and potatoes “ en papillote” or `arroz a banda´ served in paella with cuttlefish and shrimp. Hoping you have left room for dessert, try a slice of almond cake with yogurt ice cream or sample a Mallorcan cheeseboard with a selection of three cheeses. Whatever the Mallorca weather, make sure this lunch spot is on your holiday itinerary. For food, location and service, lunch here is sensational and not to be missed! Images kindly provided by Castell Son Claret. Sunday is the new Friday !